The Society Gurl got the chance to judge the competition at the Blowout 2017 Fantasy Hair Show. 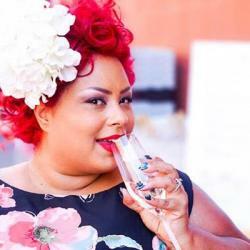 Blogger, vintage lover and cocktail shaker the Society Gurl (Jamie Ann Owens) is back this week and got the chance to judge the competition at the Blowout 2017 Fantasy Hair Show Feb. 19 at the Landmark Theater. Watch Society Gurl’s vlog below, and view Michael Davis’ photos of the event here. Jamie Ann Owens is the gurl behind the Society Gurl. She has a love for vintage items and style, a damn good cocktail, traveling, hunting for designer labels at thrift stores, throwing a party for no reason, her hubby, her furry babies, and her baby boy, Griffin Bowie. Follow her as she shares her love for her hometown, her favorite places to eat, drink, travel, and things to do in upstate New York and beyond.